By Stacy Ries, D.O., Juliann Giese, D.O., Sharon Kreuer, D.O. 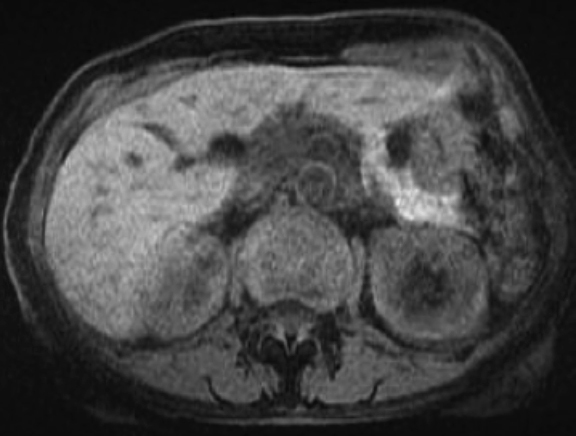 A 52-year-old woman underwent an abdominal MRI for an incidentally found cystic mass within the pancreatic tail (Figure 1A-C). She had no inciting symptoms related to the pancreatic lesion, and medical and surgical history were noncontributory. All laboratory values were within normal range. As the utilization of cross-sectional imaging continues to rise, the number of incidentally identified cystic lesions of the pancreas also increases. The goal of the radiologist is to categorize such lesions on the continuum from overtly benign to frankly malignant. This differentiation is important for clinical management, often meaning the difference between continued imaging follow-up or surgical resection. The differential diagnosis for a pancreatic cystic lesion includes a number of inflammatory and neoplastic processes. The clinical and imaging manifestations are discussed below with an emphasis on distinguishing features. IPMNs occur most commonly in the seventh and eighth decades with an equal incidence in men and women.1,2 Macroscopically, they are classified as main duct, branch duct, or mixed lesions and invariably result in ductal dilation as they produce an abundance of extracellular mucin.3,4 Microscopically, they can be divided into subcategories ranging from benign adenomas to aggressive malignancy. Given their mucinous nature, IPMNs will appear hypoechoic on ultrasound (US), hypoattenuated on computed tomography (CT), and T2 hyperintense on MRI. Main duct IPMNs carry a higher risk for malignancy and are described based on the degree and length of ductal dilatation without additional causes for obstruction. According to the 2012 consensus statement, main duct dilatation of > 5 mm should be suspicious, 5-9 mm of dilatation is considered a worrisome feature, and > 10 mm of dilatation is high-risk stigmata.5 Additionally, ductal dilatation can be classified as either segmental or diffuse based on the length of dilation. Although uncommon, bulging of mucinous material from the dilated ampulla of Vater is considered pathognomonic and typically seen only on endoscopic retrograde cholangiopancreatography (ERCP). Additional concerning imaging findings include abrupt increase in ductal dilatation with distal parenchymal atrophy and the presence of mural nodules. If no suspicious features are present, continued surveillance is recommended. With worrisome findings, patients should proceed to endoscopic US with sampling of the cystic fluid and evaluation of serum tumor markers. The decision for imaging follow-up vs. surgical resection should be based on results of these tests.5 Lesions demonstrating high-risk stigmata should proceed directly to surgical resection, if able. Pseudocysts are seen in 10% to 12% of interstitial edematous pancreatitis cases and can have variable imaging appearance.6 They typically appear as unilocular, round or ovoid, well-circumscribed pancreatic or peripancreatic fluid collections that present after 4 weeks of symptom onset. They may demonstrate thin or thick enhancing walls and can be multiple or solitary. On US, pseudocysts are anechoic or hypoechoic with variable dependent debris. CT attenuation and MR signal characteristics will vary depending on the contents of the pseudocyst and the presence or absence of infection. 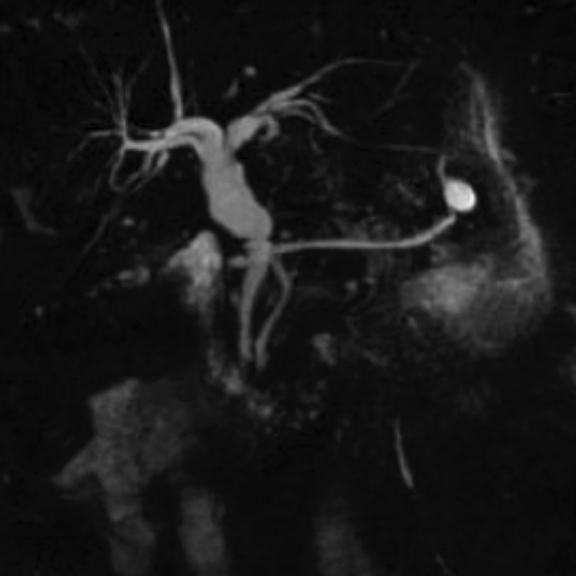 In approximately 50% of cases, a communication with the main pancreatic duct is present and is best be seen on magnetic resonance cholangiopancreatography (MRCP).1,4 Recurrence is common if this communication persists. 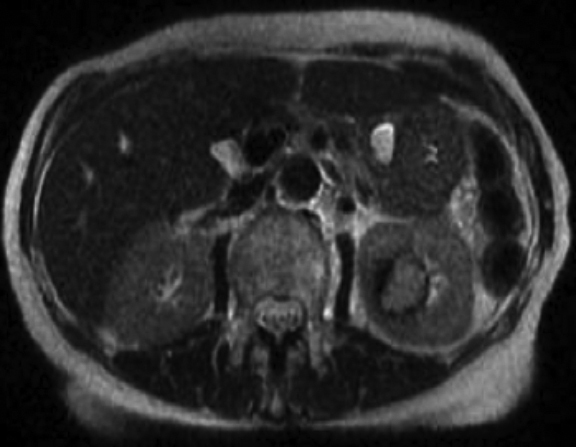 In rare cases, gas within the cyst may be seen indicating either spontaneous fistulization with the adjacent gastrointestinal tract or superimposed infection. If no overt imaging findings of infection are present and it remains a strong clinical concern, sampling of the fluid percutaneously or through endoscopy can be performed. These lesions can be solitary, multiple, or diffuse and are classified as polycystic, honeycomb, or oligocystic with 0.1 - 2 cm locules.4 These locules are lined by glycogen-rich cuboidal epithelium organized by multiple fibrous septa often radiating from a central scar. Calcification of this scar can occur and aids diagnosis, when present. The cystic components are fluid attenuation on CT and follow fluid signal on MRI with the fibrous septae demonstrating delayed enhancement on postcontrast images. Although these lesions are commonly < 1 cm, they can be > 5 cm at times. No communication with the pancreatic duct should be seen. Further evaluation with enodoscopic sampling is useful in confirming the benign etiology of this lesion when cross-sectional imaging is not diagnostic. Asymptomatic lesions < 4 cm can be followed closely with CT or MRI. However, if there is significant interval growth, or the patient becomes symptomatic, surgical resection should be strongly considered. Mucinous cystic neoplasms are found almost exclusively in middle-aged women with a peak-incidence occurring in the fifth decade.1,7 These lesions account for nearly 10% of all pancreatic cystic neoplasms and have malignant potential with degeneration into mucinous cystadenocarcinomas. Solid pseudopapillary tumors are uncommon pancreatic neoplasms most frequently found in young women with a peak incidence occurring between the second and third decades of life.1,7-9 These tumors are considered both solid and cystic due their tendency to undergo intratumoural hemorrhage.8 They have malignant potential transforming into solid pseudopapillay carcinomas. Knowledge of the clinical and imaging manifestations of various cystic pancreatic lesions allows for an accurate and efficient creation of a targeted list of differential considerations. Patient age, location of the lesion, and presenting symptoms are all important distinguishing features for cystic masses within the pancreas. The primary goal for the radiologist is to appropriately categorize the lesion along a continuum from overtly benign to frankly malignant. Additional diagnostic data can be obtained with serum tumor markers, and percutaneous or endoscopic fluid or tissue sampling as needed. Sahani DV, Kambadakone A, Macari M, et al. Diagnosis and management of cystic pancreatic lesions. Am J Roentgenol 2013;200:343-354. Fernandez-del Castillo C, Targarona J, Thayer SP, et al. Incidental pancreatic cysts: clinicopathologic characteristics and comparison with symptomatic patients. Arch Surg 2003; 138:427-434. Kawamoto S, Horton KM, Lawler LP, et al. Intraductal papillary mucinous neoplasm of the pancreas: can benign lesions be differentiated from malignant lesions with multidetector CT? RadioGraphics. 2005;25:1451-1468. Dewhurst CE, Mortele KJ. Cystic tumors of the pancreas: imaging and management. Radiol Clin North Am 2012;50(3):467-486. Tanaka M, Fernández-del Castillo C, Adsay V, et al. International consensus guidelines 2012 for the management of IPMN and MCN of the pancreas. Pancreatology 2012;12 (3):183-197. Thoeni RF. The revised Atlanta classification of acute pancreatitis: its importance for the radiologist and its effect on treatment. Radiology 2012;262(3):751-764. Kalb B, Sarmiento JM, Kooby DA, et al. MR imaging of cystic lesions of the pancreas. Radiographics. 2009;29:1749-1765. Choi JY, Kim MJ, Kim JH, et al. Solid pseudopapillary tumor of the pancreas: typical and atypical manifestations. Am J Roentgenol. 2006;187:178-186. Mortelé KJ. Cystic pancreatic neoplasms: imaging features and management strategy. Semin Roentgenol 2013;48:3. Kosmahl M, Pauser U, Anlauf M, et al. Pancreatic ductal adenocarcinomas with cystic features: neither rare nor uniform. Mod Pathol 2005;18:1157-1164. Yoon SE, Byun JH, Kim KA, et al. Pancreatic ductal adenocarcinoma with intratumoral cystic lesions on MRI: correlation with histopathological findings. Br J Radiol 2010;83:318-326. Ries S, Giese J, Kreuer S. Cystic Pancreatic Masses. J Am Osteopath Coll Radiol. 2016;5(2):23-25. Stacy Ries, D.O., Juliann Giese, D.O., Sharon Kreuer, D.O. Dr. Ries, Dr. Giese, and Dr. Kreuer work with the Department of Diagnostic Radiology, Botsford Hospital, Farmington Hills, MI.